Kayaking is a great way to destress from all the hustle and bustle of the city. It is also an aerobic fitness activity that gives you strength and flexibility. Whether you’re a teenager or in your 50s, kayaking is an outdoor sport you’re sure to enjoy. To aid you in choosing a good location, we went through some of America’s best kayaking spots and shortlisted a few just for you. The Chesapeake Bay is the largest estuary in the United States. This 200-mile long river flows across six states and is home to millions of people and thousands of plant and animal species. Among those creatures is the unique diamondback terrapin. Generally, tourists spend up to two days paddling through and discovering the beauty of this bay. Fishing is one of the highlights of the Chesapeake Bay, and the slow-powered kayak or canoe is the best way to do it. You will be able to see the fish as they swim in the water and quietly follow them with your net — a rich experience no motorboat can give you! Of course, the bay also provides amazing sceneries that only get better as you paddle forward. If you’re lucky, you might be able to catch one of its beautiful sunsets. This centuries-old river is 1450 miles long and is home to millions of species. Whether you’re seeking an adrenaline boost or just a quiet day in the river, your kayaking experience here is one you will never forget. The best part about kayaking down Colorado River is the iconic sight of one of the eight natural wonders of the world — the Grand Canyon. But that isn’t all. This glorious river runs through seven states of America — Colorado, Wyoming, Nevada, Arizona, California, New Mexico, and Utah — and blesses you with beautiful sceneries from each of these states. Gauley River is known to be one of the best whitewater destinations. Generally, fall is a beautiful season in West Virginia. But it isn’t the only reason why people from all around the world look forward to it. Every year during fall, water is released from the Summersville Dam creating the perfect whitewater rapids for adventure-seekers. 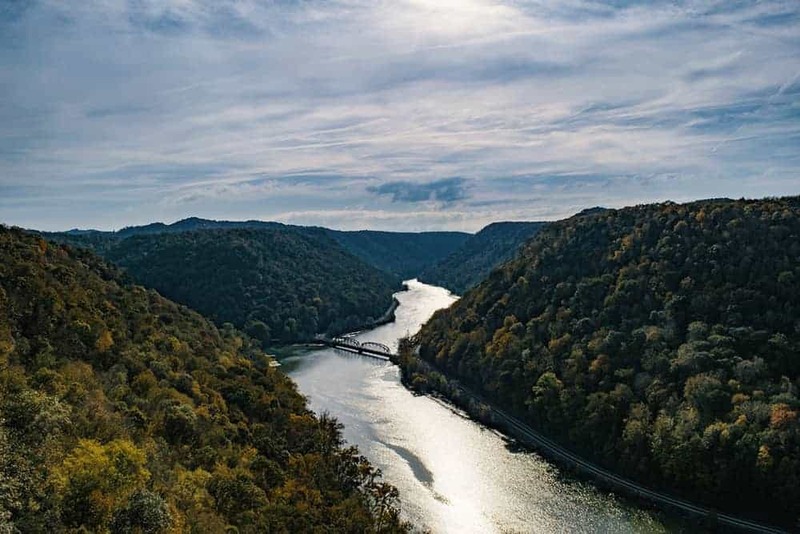 This time of the year is known as West Virginia’s fifth season, the Gauley season. Moreover, the calm sceneries you will be exposed to as you kayak down the Gauley river will give you a break from the adrenaline. You should make the most of it while you are there because these areas are not accessible on foot. Kayaking down Tampa Bay won’t only give you the amazing feeling of being away from the busy city but it will also give you just the right amount of adrenaline. Also, don’t be too surprised if you see a resting alligator as you paddle your way through these waters. Mangrove trees, snakes, fish, and all the different kinds of birds make the experience all the more worthwhile. If you take the kayak downtown Tampa, you might also catch dolphins and manatees along with a beautiful cityscape. For exhilarating rapids, the Hillsborough River would be an ideal choice. In the meantime, you could also try Tampa’s rich foods and experience its unique culture. This river is home to countless species of plant and animal life. Notably, you will find eagles and waterfowls here. As you paddle down the Tyger River, you will also see different types of plants you may never see when you are in the city. However, the problem is that kayaking services are not provided and it is up to you to find your own kayak. But the rich experience makes the added trouble absolutely worth it. Tyger’s whitewater rapids aren’t the best to satisfy your adrenaline craving, but it will still give you a sense of peace as you traverse down its waters and observe nature at its purest. Further, the Tyger River doesn’t require much skill as its rapids are relatively mild so you can bring your kids along as well if you want. It will be an adventure they will never forget. Named after King George III’s third son, Prince William Henry, this sound is part of America’s second largest forest, the Chugach National Forest. It is also surrounded by the steep and snow-capped Chugach Mountains. No wonder it is known as the “kayaker’s paradise”. Kayaking down this sound is a truly life-changing adventure because of its vastness and the abundance of wildlife you will be exposed to. If you’re lucky, you might even catch bears, humpback whales, seals, and sea-lions as you marvel at the majestic mountains and icebergs around you. The tall trees, wild animals, different types of fish, pure snow, and the thrilling sound of the water will make this an experience you will hold on to for the rest of your life. But it doesn’t stop there. You will also get to see the famous Hells Canyon, which is home to many deer and cougars. Waterfalls, beaches, mountains, and forests are also part of this great river that runs the length of 14,000 square miles. By the way, if kayaking alone isn’t enough to give you an adrenaline rush, the mountains in this region have thrilling hiking facilities too. The Mulberry River is a great place to fish as you kayak. The river’s clear water is home to millions of fish including smallmouths, largemouths, sunfish, and potholes. However, the water does get cool very quickly so t-shirts and shorts may not be the best choice of attire. Warm clothing may make your kayaking trip more pleasant for you. The best times to go kayaking along this river would be mid-March and mid-June, during which time the water level is ideal. Finally, an all-time favorite activity for tourists who kayak down this river is to gaze at the clear, starlit night sky as they paddle away. Just don’t forget to wear appropriate clothes because the temperature can get below-freezing level in the nights! If you want to enjoy a great splash with your family and enjoy beautiful scenery while you’re at it, the San Juan River is a great choice for you. Kayaking down this river isn’t as risky as most other rivers and doesn’t require too much manpower. You can enjoy a magnificent sunset as you traverse these waters. On your way, you will see amazing rock art and primitive dwellings as well. Food is easily available so you won’t have to carry too big of a supply with you. Also, if you’re a good swimmer, the water is the perfect temperature for you to jump right in. If you’re not a great swimmer, you can still enjoy a good water-splashing game with your family and friends. If you want to take a break from your daily routine, chill by the mountainside, and enjoy a beautiful sunset while kayaking in mild waters, the Arkansas River is the perfect choice for you. Its mild temperature, location, and safety will give you an opportunity to connect with nature like never before. If you still want to experience an adrenaline rush, you can bring along or rent an inflatable kayak which will give you the overwhelming feeling of class 5 rapids even in class 2 waters. Kayaking down this river is an adventure-packed experience because it has a continuous flow of class 4 rapids. However, this isn’t the wisest choice of rivers for you if you’re still new to the sport of kayaking. Camping facilities are easily accessible near this river because most tourists often take 2–3 days to make the most of the wildlife and natural sceneries it has to offer. It is also a scenic spot to fish or just relax with your loved ones as you enjoy the wind in your hair and the sound of birds in your ears. This miraculous river runs between two deserts — Chihuahua and Tamaulipas — and provides great scenery for anyone who traverses it. Its waters are cleaner than most rivers in the US and it is home to plenty of fish, which makes it an ideal fishing spot. However, this river is not apt for kayaking beginners as its rapids are too strong and can only be tackled by experts. If you want to paddle your way through the Devils River, you’ll have to mark three days off your calendar along with enough supply so you won’t run short. Clearly, this is an option only for the bravest and most daring adventure-seekers out there. But once you’ve made it across the river, it’s definitely a memory you’ll never want to let go of. This river is internationally recognized for its glorious sceneries and rich history. Kayaking down the Eleven Point National Scenic River will treat your eyes to the beauty of birch and sycamore trees. In some places, these trees even form a magnificent canopy over the river. Fishing is also a common activity on this river, but some kinds of fish require special permits to be caught. There’s more. This river flows through the charming Ozarks Hills of Missouri which were once used as gold mines by the people of the past. You could even inquire around and dig deeper into these hills’ interesting history. You sure won’t find it boring. If you want to kayak down calm waters and enjoy wildlife at its best, Clearwater Canoe would be a great option. It even has a special wildlife viewing blind where you can see waterfowls, blackbirds, cranes, and songbirds up close. The beautifully clear waters are also an excellent spot for fishing. Paddling through these waters doesn’t require too much effort, so if you’re a beginner this might be a good place for you to start your kayaking experience. There are also some beach spots and forest lands you can explore (and hike if you want) on your way across the river. Lake Tahoe is a popular destination for various activities. It is especially known for its various kayaking services with friendly coaches and sturdy kayaks available to rent. An excellent way to end your kayaking trip down this lake would be to watch the mindblowing sunset there. You could also wait a little longer and watch millions of stars light up the night sky. If you’re not able to make it for the sunset or even to gaze at the night sky, don’t worry. You can still enjoy the beautiful scenery around this lake, including forests and mountains. Undeniably, it is an excellent way to escape from the city and give your mind a break. Just don’t forget to wear clothes that will keep you warm, especially if you intend to go kayaking during fall or winter! I am just starting to pick up kayaking as a hobby and there are some nice locations here you are recommending. For my previous trips, I’ve been renting kayaks, do you think it is wiser to just buy one? Kayaks are quite expensive afaik..
Hey Brent, since kayaking is your hobby, I would recommend purchasing your personal one, especially if you have a vehicle for transportation. Or you can try out the inflatable ones which are much cheaper and lightweight. You would also be more familiar with the handling which makes it safer when out in the lake. Wow the Colorado river picture! Hi, is it dangerous to kayak in the ocean? I’ve done some kayaking on some of the rivers above but I think I want to try some sea kayaking action. Great list. The class number you added is very useful to me. Glad to hear it Clarence.